Nothing slows down a restoration more than those fiddly little fasteners, fixings and grommets that hold everything together. It is difficult to identify exactly what fixings are needed from the outset as many will be broken, corroded or missing altogether from your project. Marque specific part vendors drawings can also be quite vague on what is needed as even the original factory drawings used tend to be the overall schematics rather than detail drawings that showed the fasteners or grommets. As you reassemble your project you come across hurdles where you need that clip or pin or grommet and have to source it, order it and await arrival. 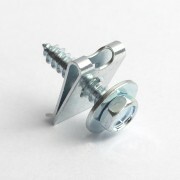 Buying fixings one at a time ad hoc can also be an expensive route, shipping and handling makes up more of the purchase price than the item itself. Therefore we’ve come up with reasonably sized packs of popular items that can take weeks off a build - hit a hurdle, select a solution from your packs of clips/fasteners/grommets and carry on. We’ve also got one or two specialised fixings that improve upon what was on the original vehicle. For instance, our Stainless MGB door hinge bolts overcome major issues with the original items, which you are unlikely to be able to remove intact. If there is an item you would like to recommend for inclusion, please drop us a line. 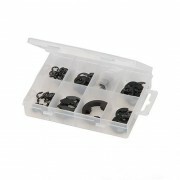 Box of 135 e clips in 8 popular sizes from 3mm to 17mm Especially useful for newer ‘classics’. ..
Often forgotten but vital for proper brake rebuilding, sealing your oil drain plug etc. Select the size to suit your application. Priced per washer. .. Box of 64 circlips in 8 popular sizes from 6 to 25mm No need to curse anymore when that circlip you’re levering off goes PING! .. 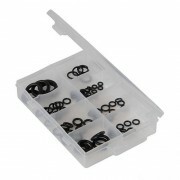 Box of 85 rubber grommets in 8 popular sizes from 4.2mm (inside dia mm) x 7.2mm (outside dia mm) to 15.4mmx23.8mm REALLY useful so your engine/water pump rebuild doesn’t grind to a halt in midflow for the sake of an O ring! .. 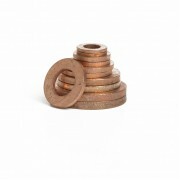 Box of rubber washers. 10 x rubber washer (ID) 14.5mm x (OD) 24.5mm x (W) 2mm; 20 x rubber washer (ID) 11.5mm x (OD) 23.5mm x (W) 2mm; 20 x rubber washer (ID) 10mm x (OD) 19mm x (W) 1.8mm; 30 x rubber washer (ID) 6mm x (OD) 14mm x (W) 1mm; 40 x rubber washer (ID) 5mm x (OD) 10mm x (W) 1mm. Never .. 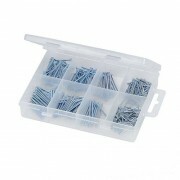 Box of 175 split pins in 8 popular sizes from 1/16” x 1/2” to 1/8” x 1&1/2” Don’t reuse that old split pin, keep these handy! 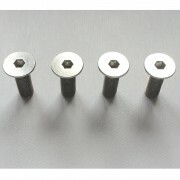 ..
Used to fix panels and access hatches to car bodywork using self tappingfasteners. Drill both panels with a clearance hole for the screw, push the clip over the edge of the panel and then screw the panels together. The clip takes up any tolerance in the exact position of the clearance hole. Used in ..
Assorted Multi-Packs of Niggly Bits! 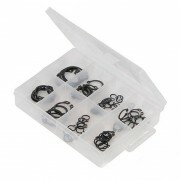 A complete set of our multi-packs of Grommets, O Rings, Split Pins, Rubber washers, External Circlips and ‘e’ clips in one bundle. 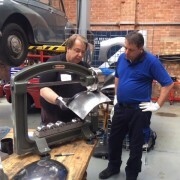 Should cover most unexpected requirements during a restoration so it doesn't grind to a halt for want of a clip! You'll be a hero for buying them .. Anyone who has tried to take the door off an MGB will know that it is a mammoth task to remove the door bolts. 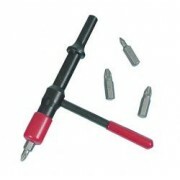 (TIP: Use a "Shake'n'Break" available in our tool section) This is due to several factors including: 1) The back of the bolts are exposed in a vulnerable corrosion area..